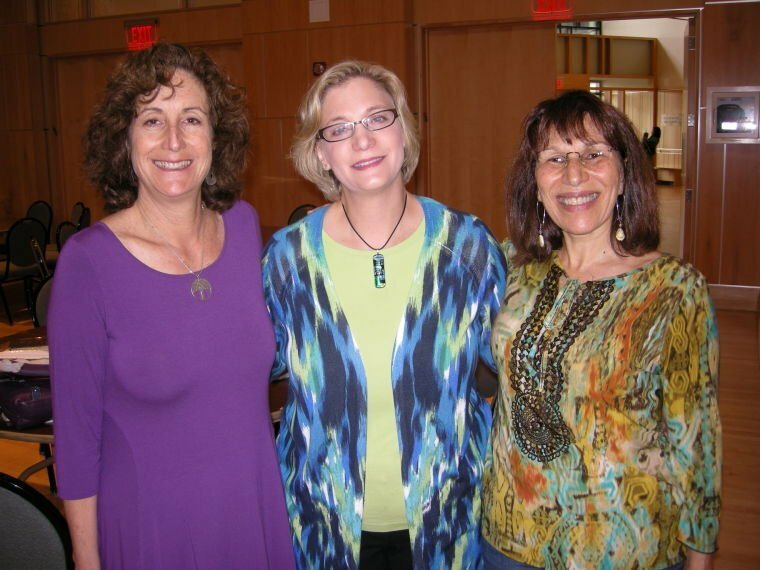 These three women organized the Rosh Chodesh Sivan service of the Cleveland Women of the Wall Solidarity Group May 10 at Park Synagogue East. From left, they are Fran Gordon of Beachwood, Rabbi Sharon Marcus of Shaker Heights and Luisa Aviv of South Euclid. Marcus is associate rabbi of Park Synagogue. 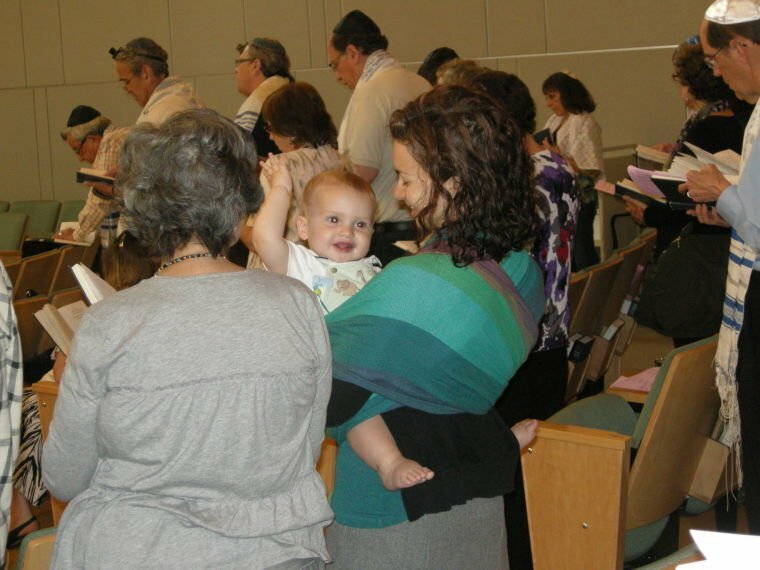 Elianna Peak, of Urbana, holds her 11-month-old son, Gabriel, during the Cleveland Women of the Wall Solidarity Group service at Park Synagogue East. Peak, who works in Woodmere, said it was important to bring her son to the service so he recognizes the importance of it and the message of the Women of the Wall. While in Cleveland, Peak stays with her grandmother, Gloria Goldstein, in University Heights. Goldstein also attended the service. Women take part in the Torah reading during the Cleveland Women of the Wall Solidarity Group service at Park Synagogue East. From left, they are Miriam Rose, Joyce Kleinman, Becky Schur, Barbara Epstein and Susan Schwarzwald. More than 40 women took part in the Rosh Chodesh Sivan service of the Cleveland Women of the Wall Solidarity Group May 10 at Park Synagogue East in Pepper Pike. The same morning, conflict was reported at the Kotel (Western Wall) in Jerusalem as the Women of the Wall group attempted to hold a non-traditional prayer gathering. Three people were arrested in connection with the disturbances, which included women being insulted and reports of objects being thrown at women. “The events of this morning at the Western Wall dramatically reinforce the urgent need for a sustainable solution which will allow any Jew, group of Jews or Jewish community to pray at the Western Wall according to their own custom,” Natan Sharansky, chairman of the Jewish Agency for Israel, said in a statement. Women of the Wall is an organization of Jewish women worldwide who strive to secure the rights of women to pray aloud, read from the Torah and wear religious garments at the Western Wall. The group has held monthly prayer services at the Wall for almost 25 years. Luisa Aviv, of South Euclid, was one of three organizers of the Cleveland WOW event May 10. She said this was the fourth consecutive time in which the local group has met on Rosh Chodesh (the first day of the month in the Jewish calendar) as part of a minyan at various synagogues. So in February, with the support of Shaarey Tikvah Rabbi David Kosak, Aviv organized the first Cleveland WOW Solidarity Group service at her synagogue. Rabbi Sharon Marcus, associate rabbi at Park Synagogue, also helped organize the latest service. The third organizer, Fran Gordon of Beachwood, also has a home in Jerusalem. The member of Shaarey Tikvah said when she’s in Jerusalem, she leads prayers with the WOW group, just as she did at Park Synagogue. Aviv said attedance at the monthly services has varied, depending on the day of the week on which Rosh Chodesh falls. She said the group plans to continue meeting monthly, rotating the synoguges.